Five members of the Jersey Special Gymnastics Club produced some outstanding routines to gain a huge haul of medals at the Downs Syndrome Gymnastics Competition in New College, Leicester. Jessica Vieira, Sinead Laverty, Eloise Clyde-Smith and Rachel Christie were all competing against each other in the Senior Girl's Level 2 competition and were in a group of eight gymnasts. The Jersey Girls proved too strong for their opposition, taking all of the medals in their Group! Rui Reis competed in the Senior Men's level 2 competition and produced some great work to win five Gold medals on Rings, Parallel Bars, Pommel, High Bar and Floor and added a Bronze on Vault. 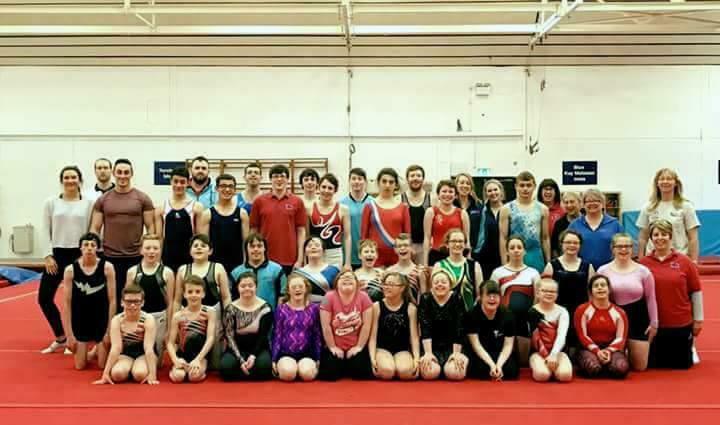 Fourteen gymnasts and five coaches from the Jersey Special Gymnastics Club were among the 38 people who attended a training weekend in Scotland. The Jersey squad are all taking part in August's Special Olympics National Summer Games in Sheffield. They trained at both the City of Glasgow Gymnastics Club, and the Inverclyde National Sport Centre. "During the weekend, our gymnasts got to learn, practice and perfect some more difficult skills into the foam pits," said Jersey head coach Yana Vibert. "This is a luxury we do not have in Jersey," she added, "but it greatly benefits our gymnasts, and enables them to learn skills in complete safety." Yana and her fellow coaches also used their time to go through routines with each other, "to make sure they were correct and to help each other with any difficulties." And she said all our gymnasts thoroughly enjoyed the experience. "It was great to use and stay at such a fantastic purpose-built top class facility that provides all accomodation, meals and training opportunities under one roof." You can find out more about the Inverclyde National Sports Centre here. Jersey gymnasts won six gold medals, and five others, at the British Disability Masters Championships 2017 in Liverpool. Alex Buesnel had an outstanding tournament at the Echo Arena, winning five Masters titles. He had to work really hard this year to keep ahead of his teammates and other competitors, but he managed to keep his composure, and produced some great routines. Alex won the Floor, Rings, Vault, Parallel Bars and Pommel titles, and took fourth on High Bar after a fall on landing, his only error of the day. Despite his first appearance at this event, Matthew Kirkland had a great competition, winning the Disability Masters title on High Bar. He also took third place on Pommel and Floor. Matthew really enjoyed the experience and was extremely pleased with his success. Aaron Bonnar won three medals, a silver on High Bar and bronze on Rings and Parallel Bars. Aaron has really improved the difficulty in his routines this year and he was rewarded with some great scores. James Lang won a Silver medal on Pommel with a clean routine, and he was fourth on three other pieces of apparatus. James was happy with his performances, and again really enjoyed the experience. Cailiegh Quail was the first Jersey gymnast to compete, in the Women's uneven bars, where she gave a great performance. Cailiegh completed a clean routine to take sixth place overall. Make no mistake, these five are some of the best disability gymnasts in Great Britain. There was a large crowd to watch the top mainstream and disability gymnasts in Great Britain compete for the various titles. British Gymnastics put on a fantastic display, with pillars with fire and smoke. Laser lights adding to the drama of the event, as gymnasts entered the arena. Alex Buesnel creates JSAD history! 24-year-old special gymnast Alex Buesnel has become the first member of the Jersey Sports Association for the Disabled to be selected for the Island Games. He has made the 13-strong Jersey gymnastics squad for the 2017 Games in Gotland this summer. This historic selection comes just three months after Alex became just one of four British ambassadors for gymnastics. “I am delighted, and honoured, to have been selected to represent Jersey,” he said. Read how the BBC’s Brent Pilnick reported this historic occasion. The last words on this are perhaps the most telling, from Paul Patterson. Following some outstanding routines, our six gymnasts took home four gold and two silver overall medals at the 2016 London Regional Competition at the Falcon Spartak Club in London. Rui Rees found himself with the highest overall score of the day when taking gold at Level 2, while Leandro Loretto scored a perfect 20.00 on rings, keeping ahead of team-mate Harry Sinclair, the two of them taking gold and silver respectively. Eloise Clyde-Smith, at level 2, and Loiuse De Freitas, level one, both took golds in their age group, with Ella Davidson winning silver at Level 1. Fifteen gymnasts from the Jersey Special Gymnastics Club came back from the Great Yarmouth training camp and competition at the Waveney Gymnastic Centre with five overall gold medals. At level four, Alex Buesnel dominated all apparatus to take the title, while Matthew Kirkland, at level three, also won overall gold. There were also overall golds for Jack Pearl and Jessica Viers at level two, and at level one, for Alex Wheatley. All the Jersey gymnasts that attended are off to the National Games in Sheffield next year, so this was a great opportunity for team building. This event gave our gymnasts the chance to train alongside others in a purpose built training facility. All ten members of the Jersey Gymnastics Club who competed in the 2016 Poole Open Artistic Gymnastics Competition came home with medals from the Rossmore Leisure Centre. There was a clean sweep of three golds for Anais Martin-Cellier in her group. In the Under 16 Level 1 competition, the three Jersey girls Alex Wheatley, Ella Davidson and Louise De Freitas showed their experience by each claiming a gold medal. Three of the gymnasts, Isabella Mendes, Isabella Doucet and Rowan Flambard were making their UK competition debut, with all three faring really well. They enjoyed the experience, and came back with medals. Talia Racjan won gold on Vault and bronze on the floor, while Harry Sinclair and Jayden Hender both competed at Level 1, winning three silver medals between them. All in all, a very successful campaign, and you can see the full results below. Alex Buesnel is British Disability Open Champion for the ninth year running. This fantastic achievement was made possible by his outstanding floor and rings routine which kept him ahead of the competition. And if that was not enough, it has been announced that Alex is to be one of only four British Gymnastic ambassadors for his sport. But this was far from a one-man show for Jersey Special Gymnastics Club, as the other five Jersey competitors also produced outstanding performances at the Lilleshall National Sports Centre. Aaron Bonnar took a great second place overall. He completed four new skills and was successful in all of them. James Lang and Matthew Kirkland also had great success on individual apparatus. This was Matthew’s first year of competing in the senior competition. Cailiegh Quail achieved second place overall in the Ladies Senior Open. This followed a great bar routine, and she also scored well on the vault. And 40-year old Rui Reis, competing in a very large group in the Men’s Senior B, won overall gold, and won a medal on every piece of apparatus! Full details in the table below the image.